A rain barrel is any type of container used to catch water flowing from a downspout. Rain barrels reduce the amount of stormwater runoff by collecting roof runoff and storing the rainwater for future use. The rain barrel is placed underneath a shortened downspout, diverting the roof runoff into the rain barrel. Placing the rain barrel on a STURDY platform will allow for more clearance under the spigot, and it will also increase the rate of flow if you are attaching a hose to the barrel’s spigot. How do I maintain and rain barrel? During the spring and summer months routinely inspect your rain barrel. Remove any debris that has accumulated on the lid that might block the screen mesh. You should also routinely clean the inside of your rain barrel. During the winter months, remember to take your barrel out of operation. Simply turn it upside down or store it inside and redirect the downspout away from the foundation. They will help reduce peak volume and velocity of stormwater runoff reaching lakes and rivers. Water collected from rain barrels is not suitable for human or pet consumption. Due to lack of research data, water collected in a rain barrel is not recommended for watering fruit or vegetable gardens. The water flow (and pressure) will be less than from your outdoor spigot, making sprinklers ineffective. Plan to use soaker hoses, handheld spray nozzles and/or watering cans. Elevating your rain barrel on a sturdy platform will increase the flow. 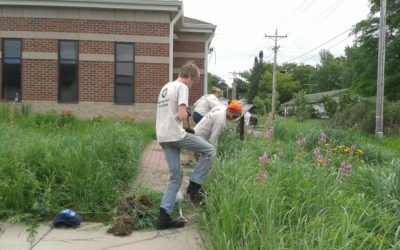 A rain garden is a planted depression, or low area, that allows rainwater runoff from impervious surfaces (like roofs, driveways, walkways, and parking lots) to soak in. Rain gardens also help remove pollutants from water before it enters a local stream. Prevent erosion by holding soil in place with their deep roots. Require little watering and maintenance once established. Whether you live in the city or along a lake or river, managing stormwater runoff is important. Rooftops, roads, driveways, and sidewalks are hard surfaces that prevent rainwater and melting snow from reaching the soil and soaking into the ground. These hard surfaces also tend to collect nutrient-rich yard and pet debris, oil and radiator fluid from autos, and other debris and pollutants. During a rain event or snow melt, fast-moving runoff washes the nutrient-rich debris and other harmful pollutants away, often directly into lakes, rivers, and wetlands. The greater amount and increased speed of water flowing off hard surfaces can erode soil and carry it into our surface waters. In the summer, runoff is often warmed as it flows over hard surfaces. If the warm runoff enters lakes and rivers directly, it can affect aquatic life. A rain garden is one way to address all of these problems. Rain gardens are designed to collect stormwater runoff, preventing the runoff from flowing directly into lakes, rivers, and wetlands. They allow runoff to soak into the soil, filtering out pollutants before entering the groundwater. Rain gardens also allow sediments to settle and plants to absorb nutrients.